Help curious preschoolers find out more about themselves with these fantastic lift-the-flap board books. 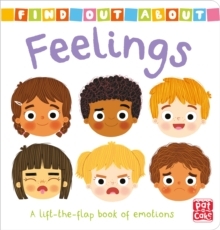 Find Out About: Feelings helps curious preschoolers get to grips with their feelings and emotions - a key topic for both them and their parents. Featuring friendly child characters and familiar situations, they will find answers and reassurance when they are feeling happy, sad, frightened, brave and everything in between.